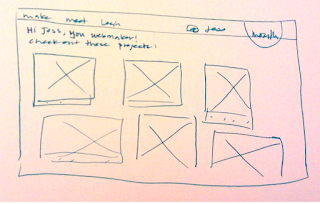 Mark wrote about vision, then Erin wrote about product definition, and then Chris wrote about the engineering and so now, I will give you the fourth chapter in the Webmaker epic: how we are designing Webmaker. Concretely, what does this mean we are doing? By evolving the architecture of Webmaker to be focused on the maker (learner) we will shift from a brochure site into a platfrom. 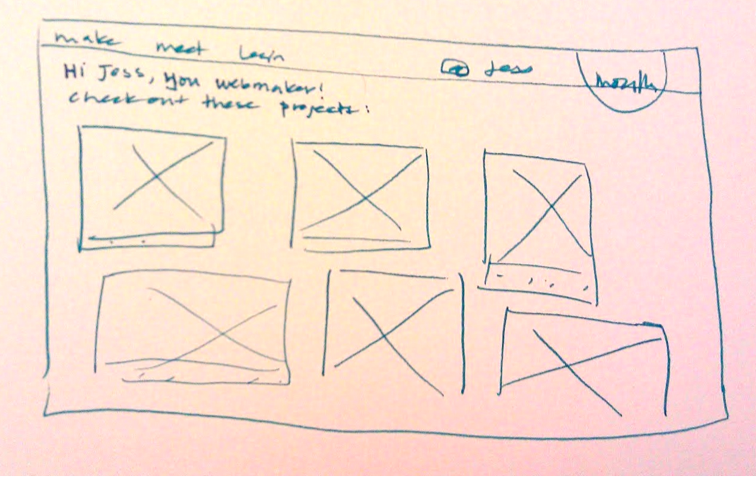 We will be designing an experience for a user who is coming to Webmaker to make something. At Mozilla we are super successful at activating users to take action at physical events and meetups like MozFest - we want to harness that grassroots spirit and concretely mobilize users to feel empowered to come to Webmaker and make things. This will mean right from the start giving the user simple calls to action to make, meet and learn. 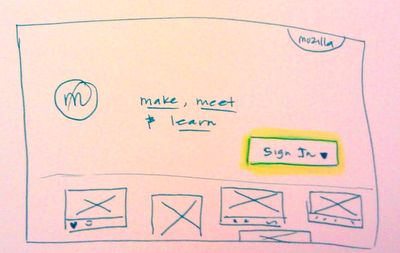 Above is a sketch of what the future webmaker.org could look like. The focus will be on things that you can make and users will be able to open projects within or be directed to the appropriate tool to make that project. One aspect of this will be implementing a universal navigation (wireframed above- click to see more exploratory images). This is a navigation that we will be implemented across all properties in Webmaker, and allow the user at any given moment to tap in to their projects, learning dashboard and community. At first we will be implementing a version of this in Thimble and as we iterate, we will roll it out across Webmaker- apps and web properties. 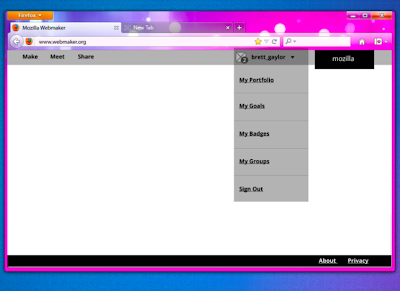 The idea is that it will be a personalized navigation- so it will speak to your unique Webmaker experience. When you log in to Webmaker through Persona, you will be able to access a dynamically generated set of projects that are catered to your specific interests - through some kind of interactive filter. In conjunction with the projects, the personalization will extend throughout the site - you will see events in your region, people who have similar interest, skills that you can improve upon etc. Some of the specifics of this are still being brainstormed by our Learning and Engineering teams, however this is just a rough sketch of what will be possible in the future. 3. 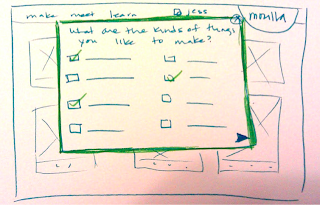 Design with learners, iterate, release- rinse- repeat. Our m.o. here is to design not just a user experience- but a learning experience. We will be designing with learners and those hacktivators who are in the position to teach or empower learners so that we are constantly testing, iterating and improving our product. We have a fantastic community of learners and hacktivators in the Hive - in New York, London, Berlin, and beyond. Additionally we have a large extended community of individuals passionate about contributing to an open source and open educational resource project. We are going to work with this community as a lab- where we can launch early and often, user test and develop this platform out to be a tool that they will use. There's a lot of work described here and we aren't going to being rolling it out all at once. Our next major milestone will be in November. We are going to be releasing a bunch of half baked and fully baked ideas at the Mozilla Festival. 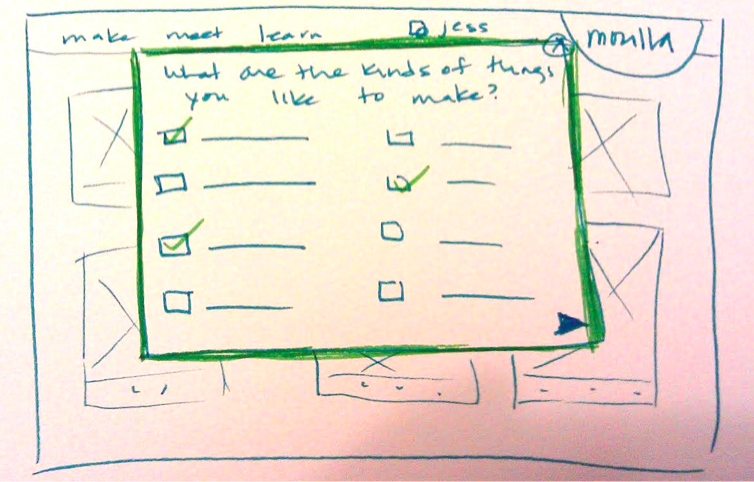 It is a great chance for us to user test concepts, incubate ideas and elevate great ideas into our products. It's going to be a fantastic few days where our designers will be out in the field doing what we do best- making stuff in the open, with passionate community members. To continue to be part of the conversation, please join the Webmaker mailing list or come to our weekly calls.